Devoted Quilter: Round Trip Quilts - Second Last Round! 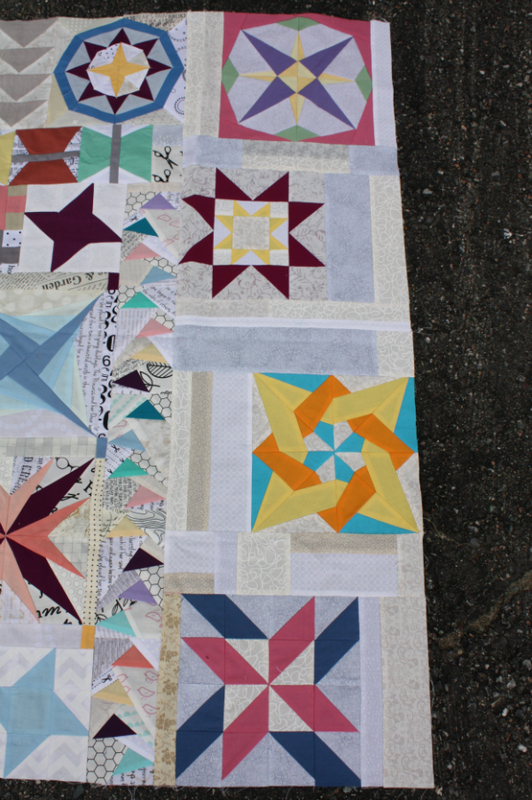 It's hard to believe we're almost finished with Round Trip Quilts! This time around I have Chelsea's quilt. Chelsea blogs at Patch the Giraffe and she asked that we use solids and low volume background fabrics for her quilt. 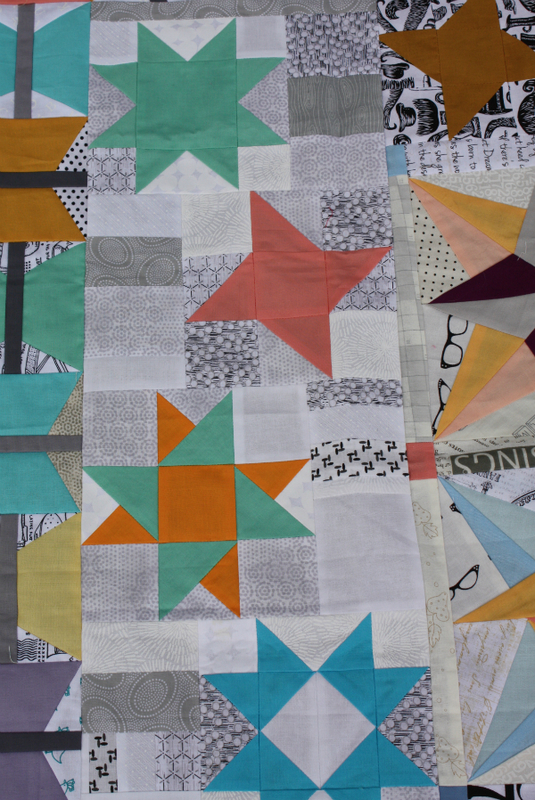 There are so many beautiful blocks in this quilt! I made four blocks, planning to add them as a simple border along one side. 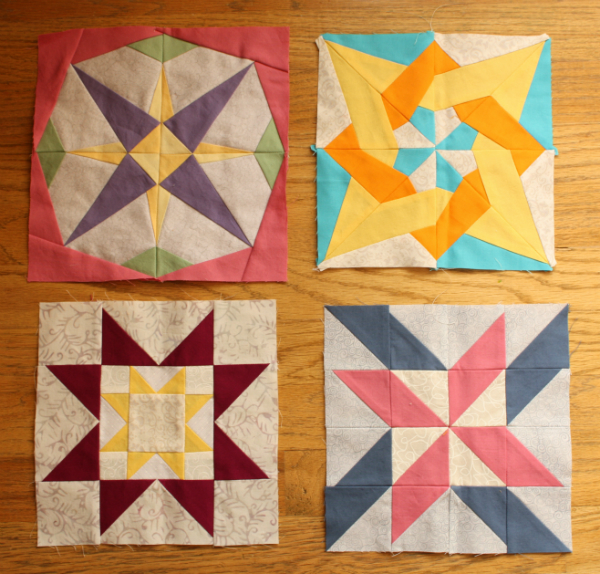 Unfortunately, the top left block was a 12" block from Quiltmaker's 100 Blocks, issue 11, and when I resized it my math was off by a bit. So, instead of finishing at 8" like the other three blocks, this one finished at a little more than 9". While I love the block, I didn't really want to make another one, so I put it aside and thought about it for a while. When I noticed that the star blocks are offset in this border, I had my plan. Some strips of low volume scraps and I had my four blocks offset in a wider border. I think it worked well in the end. 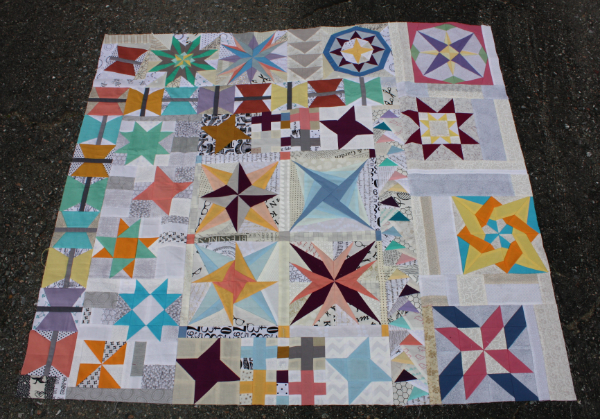 Here is what Chelsea's quilt looks like now, ready for Mary to put the finishing touch on it. Only one round left to go and then we'll all get our own quilts back...considerably larger and more amazing than they were when we sent them out as starter blocks back in September! 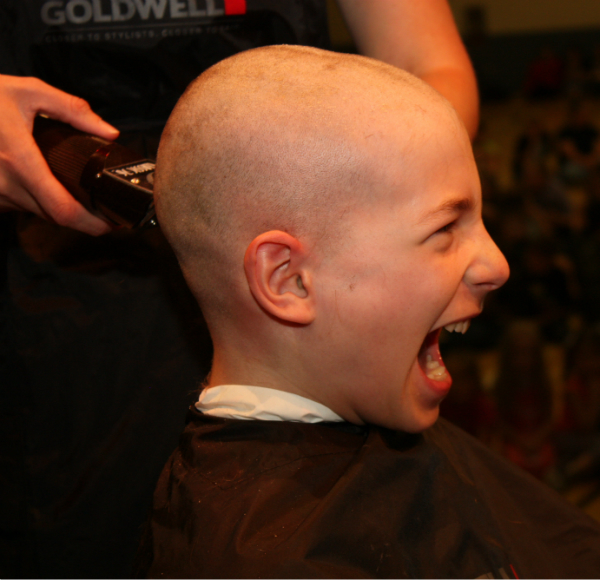 In completely unrelated news, Aiden participated in a Shave for the Brave event at school today, raising money for Young Adult Cancer Canada. We are so proud of him! One of his teachers (who was rather fond of his beard) said that if Aiden raised a certain amount of money, he'd shave his beard. In this picture Aiden is laughing at the beard-shaving progress. The whole event was a lot of fun, and Aiden seems to really like his new look. This looks great Leanne! Seems like the month of bad math though! What a fun quilt! I love the blocks that you made for it. One of these days I will have to participate in one of these swappy, QAL kind of things! I really like your additions to the quilt. They go well with the other blocks and continue to add and build on the design. What a fun idea! I like your additions -- they complement the rest of the top beautifully! Thanks for linking up to TGIFF!